The global smart fabrics market features a highly competitive market with numerous companies focused on expanding their market share through research and development activities, reports Transparency Market Research (TMR). Recent advancements in technologies has driven the competition in this market. Major players in the global smart fabrics market encompass Toray Industries, Milliken & Company, Ohmatex Aps, Oneill Wetsuits L.L.C., Adidas AG, Infineon Technologies AG, and Outlast Technologies LLC. ). 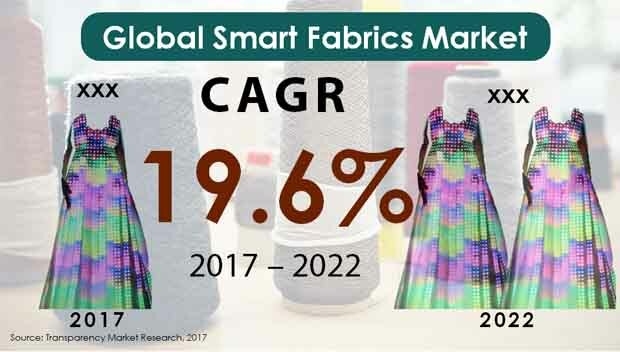 Prominent players in the market are emphasizing on leveraging new technologies to come up with new products to strengthen their hold in the global smart fabrics market. As per expert analysts, the global smart fabrics market is anticipated to grow vigorously during 2017 to 2022 with a CAGR of 19.6%. In 2017, the market recorded a valuation of U.S. $2.2 bn which is estimated to rise to U.S. $5.5 bn by the end of forecast period. In terms of product type, passive smart fabrics segment is envisioned to lead the smart fabrics market. This is on account of the numerous benefits it offers such as high efficiency and ease of manufacturing. On the geographical frontier, North America dominates the market owing to technological advancements and gadget sales in this region. Discovery of smart fabrics is a landmark in the ever growing wearable devices industry. Consequently, it has it has boosted the demand for wearable devices, thereby ascending the growth of global smart fabrics market. Moreover, the consumer preference has shifted to miniaturized electronic devices that offer comfort and convenience. This has played a key role in booming the smart fabrics market. Smart fabrics are superior to other wearable devices in many aspects such as data transfer, communication, and electric conductivity. These factors have led to a rise in demand for smart fabrics, thus expediting the smart fabric market’s growth. Additionally, the ease of use offered by smart fabrics has spurred the market’s growth. In addition to the aforesaid drivers, development of smart fabrics that offer recyclability and reusability has increased the consumer base of the market leading to its expansion. Furthermore, features such as low power consumption and integration of Bluetooth Low Energy (BLE) technology that offer better regulation of data will boost the smart fabric market’s growth. The development of low-cost wireless sensors has also led to the market’s expansion. However, there are a few hindrances that may thwart the global smart fabrics market’s growth. Factors such as lack of workforce and initial investment may cause a shortfall in the global smart fabrics market. Nonetheless, companies are focusing on improving the functionality and aesthetics of the product. Additionally, they are emphasizing on new product developments. These factors may present new growth opportunities for the global smart fabrics market. Healthcare industry demands real-time monitoring of patients using devices offer motion sensing. Smart fabrics optimally serve the purpose by offering benefits such as pressure sensing and electrocardiograms. This has presented several growth opportunities for the global smart fabrics market. Moreover, the new smart jacket launched by Nova known as the Twinery MAS has helped smart fabrics market expand its frontiers globally. Nova has used LightGuide technology that facilitates high visibility through illumination. In addition to this, it has a tiny detachable battery and is machine washable. This is a major breakthrough in the smart fabrics technology and will create new growth prospects for the smart fabrics market. The study presented here is based on a report by Transparency Market Research (TMR) titled, “Smart Fabrics Market (Product - Ultra-smart Fabrics, Active Smart Fabrics, and Passive Smart Fabrics; Application - Sports and Fitness, Medical and Healthcare, Automotive and Transportation, Protection and Safety/Military, Fashion and Entertainment, and Home and Architecture; Function - Energy Harvesting, Sensing, Thermoelectricity, and Luminescent) - Global Industry Analysis, Size, Share, Growth, Trends and Forecast 2017 – 2022”.